Is it just me, or is everyone all about kale chips lately? No? ...Ok, maybe it's just me and my healthy nerd friends. 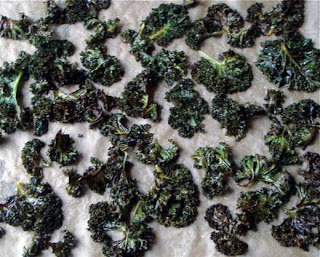 Regardless, kale chips are so good, you don't even have to be a health nerd to like them (and you can always alternate them with handfuls of Doritos). I've never been a huge kale fan (so bitter! ), and I'd always buy the stuff and then let it go bad while I tried to come up with something inspiring to do with it. Problem solved! Yum. Preheat oven to 350F. Rinse and tear up the kale, discarding the stems. Put in a bowl and toss with the olive oil. Spread out on a baking sheet and bake for approx 20 mins (you want them to be crispy but not charred). These are awesome just tossed with salt & pepper, soy sauce or balsamic. You can also sprinkle nutritional yeast on top if you want a little cheesy goodness. Full of vitamins and deliciousness, guaranteed. Thanks to Tracey for turning me on to these!